Heritage Village in Southbury, CT is a peaceful, amenity-filled oasis conveniently located between Manhattan and Boston. Built by Heritage Development Group and Pond Place Development, its 2,580 spacious residences provide gorgeous views as well as a sense of privacy. Tucked into the rolling Litchfield Hills of Connecticut, Heritage Village's attached homes are set amid 1,000 pristine acres in Historic Southbury. Thanks to the neighborhood-style design and the variety of clubs and activities offered, residents can quickly become friends. 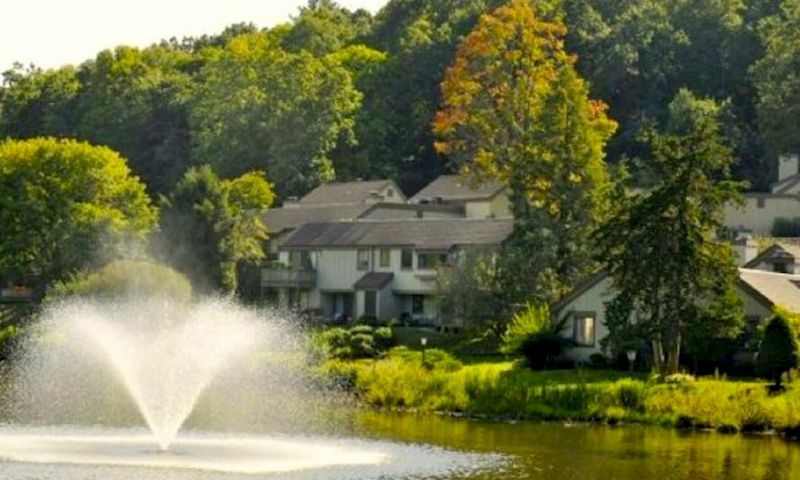 Residents of the 55+ Heritage Village neighborhood enjoy the seamless unity of the natural environment with man-made amenities where natural ponds, rivers and trails are enhanced by an 18-hole golf course, tennis courts and private pools. The community features three activities buildings, an art studio and a shop for woodworking and metal working. Residents can also enhance their gardening skills and grow their own flowers and vegetables in the multi-acre gardens next to the Pomperaug River. Heritage Village even provides hand tools, wheelbarrows, mulch and hoses. The main activities building includes a 200-seat auditorium that's home to concerts, films, plays and musicals. The Fireside Lounge is a converted barn with a full kitchen, which is the ideal spot for meeting up with friends, playing cards, getting crafty or relaxing in the fireside room. The Lodge has an enticing patio by the duck-filled pond, a big-screen TV, card games, shuffleboard and more. Originally built in 1740, Heritage Village's Meeting House, once the home of pianist and entertainer Victor Borge, is ideal for meetings of all kinds. During summer, its porch is a quiet escape overlooking a tranquil pond. Heritage Village also is home to the Ethan Allen Library, a historic building once owned by Ethan Allen himself. It features more than 10,000 best sellers, reference materials, DVDs and more, and is just down the road from the Southbury Public Library. Heritage Village is home to a renowned 18-hole golf course, as well as a challenging 9-hole golf course. Residents can join either club, both or neither, as golf club dues and fees are not included in Heritage Village facilities. Heritage Village also offers a tennis court and a fitness center with an indoor walking track, plus the latest fitness equipment and free weights. Heritage Village offers four private swimming pools, including a heated Olympic-size pool and a pool with a covered picnic pavilion. Residents at Heritage Village can choose from a variety of different models of resale homes with one to three bedrooms, ranging from 955 to 1,689 square feet. Built between 1967 and 2005, these homes have open floor plans with private patios or decks, fully equipped kitchens and individually controlled air conditioning and heating. One to three-bedroom condominiums dot the landscape in small clusters for a unique sense of community. Homes also include covered parking, plus storage area, for one car and outdoor parking for a guest or second car. Residents can expect double-pane windows and sliding doors, wood-burning fireplaces in most homes, wall-to-wall carpeting, ceramic tile baths, American Standard bathroom fixtures and full appliances, including dishwasher, garbage disposal, washer and dryer. If residents don't have a few hobbies already, they're sure to find some they love at Heritage Village in Southbury, which has more than 100 activities, clubs and organizations to choose from. Active adults can join the reading club, democratic club, bible talk, hiking club, or jazz club. They can also participate in fun activities like woodworking, music, tennis, writer's group, Jewish culture, or jewelry making. Whatever interests or hobbies residents may have, they are sure to find something to keep them busy throughout the year. Heritage Village in Southbury is in the heart of all Connecticut has to offer, including the state's best medical care, shopping, dining, performing arts and state parks. Within easy driving distance, residents will find plenty of cozy inns and quaint shops that Connecticut is known for, as well as a beautiful shoreline and even casinos like MGM Grand at Foxwoods or Mohegan Sun. For farther travel, New Haven is about 20 miles east, Hartford is only a 40-minute drive away, and Bradley International Airport is 55 miles away. Adults aged 55+ can enjoy living a maintenance-free lifestyle with a social calendar full of activities and clubs that can make their leisure time more active in Heritage Village in Southbury, CT. The Activities Building is host to most of the social, cultural and physical activities. This converted barn located near the main Activities Building is the perfect place for playing games or enjoying small gatherings. Relax at the Lodge on the patio or use any of the outdoor amenities. This 1740 historic building was once the family home of famed pianist, entertainer, Victor Borge and is now one of the main community centers. This converted stable is now a favorite location for artists in the community. Winship has machines and materials for building things such as furniture, bird houses, shelves. The Ethan Allen Library has 10,000 books, audiotapes and movies and is located near the Meeting House. The Fitness Center has all of the cardiovascular and weight-training equipment to maintain an active and healthy lifestyle. The River Garden & Shed is an open space for planting near the Pomperaug River. Residents have the option to play at two public golf courses that they can join for a nominal fee. There are plenty of activities available in Heritage Village. Here is a sample of some of the clubs, activities and classes offered here. Attached homes offer 995 to 1,689 square feet of living space. These homes have one to three bedrooms, one to two-and-a-half bathrooms, and undercover parking for one car as well as outdoor parking for a second car or guest parking. These attached residences are low-maintenance and are available on a resale-only basis. My parents, and now my mother, have lived in the village for over 25 years and it was the best choice they could have made. There is a rich selection of activities and facilities: pools, tennis courts, theater group, woodworking barn, community gardens, and countless clubs and events. It is safe and beautiful, and the units are affordable. It is very well managed, and there has not been a single special assessment ever. I bought a 2 bedroom/2 bathroom condo here in 2011 for 65,000! Having lived in Greenwich & Norwalk- I was thrilled to find a condo community with a wide variety of clubs and amenities. Heritage Village is a wonderful community for active seniors who enjoy a variety of social events. I have met lots of friendly residents playing tennis, pickleball, badminton, ice skating, swimming, hiking & village trips. The HOA fees are a little high - but my property taxes are low. I am single and safety is a high priority for me- I feel very safe living in the village. This is not a place for seniors who require assisted living or have mobility issues. I need my car to participate in all the activities I choose to do. I live in a 4 plex and feel fortunate to have wonderful neighbors. I am still considering a move to Florida- CT taxes may lead me in that direction. Fairly nice place. As it was built some clusters went up over here, some over there and later spaces in between were filled in. They were numbered along the way resulting in numbers shifting wildly. Some make sense but turn the corner numbers change from 55 to 660! 500's are probably broken up the worst all over the place! So visitors can't find where they are going because there was no grand vision of organization and order in the 1960's start. Roads are extremely narrow and parking well below adequate. This might be Heritage Village's biggest turn off. You may have a dozen unit with one car garage each then only 4 or 5 spaces available. Residents with second vehicles, home companions, friends & family, the plumber, carpet cleaner, garbageman, all compete for these few coveted spots! Snow removal is a problem- no where to put the snow! Any decent winter and they have to truck it away NYC style because of the lack of generous expansive lots. But it looks good 3 out of 4 seasons! Was built for FL but in CT. The crews do a pretty good job staying on top of it and do not skimp applying sand and salt generously to make avoiding slips and falls as much as humanly possible. I was a kid in the 70's and a teen in the 80's. I remember seniors- my grandparents, neighbors, from church, friends at school their grandparents or neighbors...these people are not them!!! I see things today in Heritage Village I never saw seniors doing then; driving FAST, not yielding right of way, incomplete stopping at signs, passing, cutting off, these are not the people who retired during the Vietnam War! These people are different, most especially the women! They are seniors in name only and do not live an out of date backwards kind of lifestyle. They drive Hondas and Toyotas and Subarus for crying out loud! Just moved here. Great community for Baby Boomers coming of age and changing the landscape of retirement. .. part time employment opportunities in the area and affordable home prices that allows travel and a month or two in the sun. My husband and I have visited Heritage Village and are strongly considering it for our retirement years. We have family in the area and love visiting our grandkids, but want to be able to come home to a quiet, peaceful, kid-free zone. I'm confident that we'll find the community very welcoming and comfortable. they are antiquated and not relevant to today's world. get use to people that have difficulty thinking "out of the box" There is no public transportation and travel to NYC is cumbersome to say the least. There are buses in town directly into nyc but the cost can be prohibative. the units themselves are comfortable and it is fairly "cheap" to live here. you have lovely space around each unit and the grounds are beautiful. 55places.com is not affiliated with the developer(s) or homeowners association of Heritage Village. The information you submit is distributed to a 55places.com Partner Agent, who is a licensed real estate agent. The information regarding Heritage Village has not been verified or approved by the developer or homeowners association. Please verify all information prior to purchasing. 55places.com is not responsible for any errors regarding the information displayed on this website.